Jess Good Candy, under jockey Ivan Carnero, winning the $3 million All American futurity(G1) at Ruidoso Downs Labor Day. RUIDOSO DOWNS, NM�SEPTEMBER 7, 2015�The Estate of Carl Pevehouse�s Jess Good Candy raised his record to four-for-four with a spotless, professional win in the Grade 1, $3 million All American Futurity on Labor Day at Ruidoso Downs before a record 24,815 fans. The four-day Labor Day weekend had a total of 54,083 in attendance. 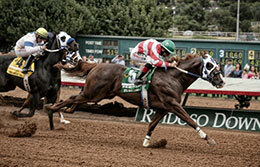 The All American Futurity pays the largest purse of any two-year-old horserace in the world. Pevehouse who died in April, 2014 had been one of the most respected owner/breeders in Oklahoma. Horses Pevehouse bred are easily recognized because they carry �Candy� in their names. Pevehouse was the breeder of Jess Good Candy. Jess Good Candy raced the 440 yards in :21.414 to win by a neck over One Fabulous Eagle. Ivan Carnero, 23, was aboard for his first All American Futurity win. Tf Im That Guy took third, one length behind One Fabulous Eagle. Jess Good Candy, the first horse trainer Clinton Crawford qualified for the All American Futurity, was in tight quarters at the start and then the horses next to him moved away from Jess Send Candy. He had a clear path and pushed his way to the front. Then he surged to get the win over a very game One Fabulous Eagle. A son of first crop sire and world champion GOOD REASON SA and the Mr Jess Perry mare Jess Send Candy, Jess Good Candy was making his stakes debut. He easily won his maiden at first asking at Remington Park back in April and then came to Ruidoso and won his trial to the Grade 1, $750,000 Ruidoso Futurity in his local debut. He won by three quarters of a length, but his time was not fastest enough to earn a spot in the futurity. Crawford waited to the All American Futurity trials in August to run Jess Good Candy again and he came through with the third-fastest qualifying time on the second day of trials. There were 34 trials to the All American Futurity with 17 trials of each day. The horses with the five-fastest times on each day competed for the record $1.5 million first-place check in the All American Futurity. GOOD REASON SA stood his only season at stud at Royal Vista Ranches.